I stumbled across some very interesting science kit, the EmDrive (Wikipedia link). To explain why this is so remarkable takes a little bit of rocket science. When we go to space, we propel ourselves by throwing things out of the spacecraft at high speed. Accelerating the mass out of the spacecraft provides a force that accelerates the spacecraft in the opposite direction. This is the stuff Isaac Newton wrote about. "Force is equal to Mass times Acceleration." This means that it is a viable means to propel your spacecraft by having a Baseball pitcher stand in the airlock and throw fastballs out into deep space. With every throw, the ship gets a nudge in the opposite direction. The problem with this is that baseballs, and rocket fuel in general, is heavy and we have to haul it all up into orbit with us before doing anything interesting. If the emDrive works, we don't need any more baseballs. We can convert electricity directly into motion. If it works this is a civilization-changing invention like the discovery of fire, the invention of the printing press, or the invention of the steam engine. It can fundamentally alter the course of the human race. That seems like pretty big shoes to fill. I'll explain. The way spaceflight works today is we burn a bunch of fuel at the beginning of the flight, and coast to where we're going. If we're lucky, we can "slingshot" around a moon or planet to help us get moving really fast. This method works. We've used it to fly-by every planet in our Solar System. It might take a while, but we'll get there eventually. 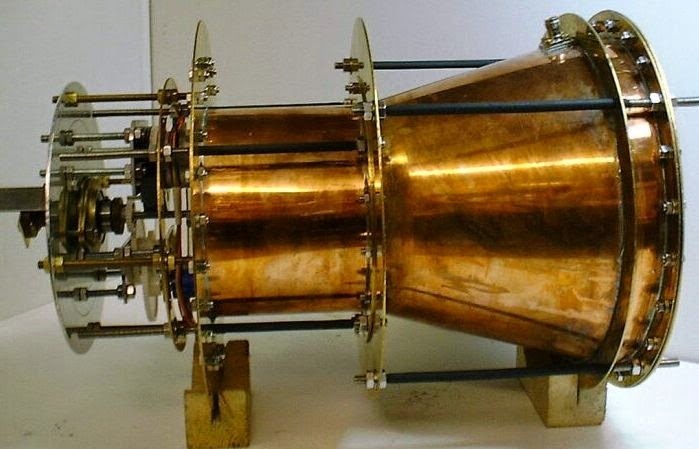 With "propellant-less propulsion" like the emDrive we can change how we fly. Instead of coasting "down the hill" we can accelerate almost all the way to Mars. Our flight times can go from Months to Days. Exploration and Colonization move from Science Fiction to "Next Year." Scuba-dive on Europa? I can't see why not. I've said a couple of times in this post "If it works". That is a big "if". Mr. Newton's physics have been around a long time, and this breaks them. That is a big deal, and a lot more research needs to be done to nail down the new science. The inventor is off to an excellent start. He's published his work and it's been replicated at least twice. He's got working models that produce meter-grams of force, and theoretical models that can lift a car with less energy that we use now to drive. Sign me up. If I were in High School today, I would go to University and study to work in this field. The growth opportunities from this make the dot-com boom look like kindergarten. I'm not in High School, but I'm still going to try. I'm reading "Microwave Engineering" tonight, and packing in a bunch of coursework. The technology is still a baby, and I'm definitely getting in. This is going to be huge! Remember the Flying cars in the Jetson's, Star Wars, and every other sci-fi show since you were 6? This is the technology that makes that a real thing. Nobody else is going to build me a flying car, I guess I will have to do it myself! My Daughter and I are learning Spanish together. We're using this great website, DuoLingo.com. The idea is that she and I will be able to talk with our "secret language"
Sounds great, right? It is. One minor complicating factor. My son wants a secret language too. Yep. I'm learning German and Spanish simultaneously. ich bin ein Pingüino? Ella es eine Frau? I just finished reading The Martian by Andy Weir. This is a survival science fiction novel that tells the tale of a man's struggle to survive and escape Mars after being left behind, presumed dead, on an early manned mission. The book is absolutely fantastic. I read it in one sitting, and could not put it down. 9,000 stars, 1 billion internets. Fantastic. Normally I put a link here to the book on Amazon. Here it is. Also, I'm placing a link to download the .ePub of the full book for free on my public dropbox here. Copyright Info “The Martian” is copyright © Andy Weir, 2011. Al rights reserved. The cover art is an image from NASA and is public domain. Al fonts in this document are public domain. Redistribution of this e-book is permitted, so long as it is distributed for free. Any content complaints or DMCA notices can be sent to Elizabeth.a.Greene (at) gmail (dot) com or left in the comments. Enjoy! I love my kids. I really do. They can't remember to brush their teeth for anything. This gave me a lovely idea today. I should manufacture a toothbrush that starts playing music if it sits still for 24 continuous hours. The only way to stop the music should be to shake it (i.e. by brushing your teeth) for 30 seconds. Today I got Gmail reminder to "check up on that free energy stuff". The e-Cat system (LENR, not free energy) still remains a black box, despite the company's claim that they have one in production. I think I'm going to have to build one of these to sate my curiosity. The Orbo team is producing the resounding sounds of Crickets. The EMC2 (Fusion, not free energy) team is back at work. It looks like they were able to wrangle some dollars out of the Navy. Lovely. I think I will have a go at the E-Cat. It seems like fairly simple rig to try. BTW, sorry for the long sabbatical I'm juggling some projects at work and have been reading a lot. I should have book posts this week about "Frozen in Time" (historical non-fiction about Airplanes on Greenland) and "The Interrogators" (non-fiction about the experience of a military interrogator in Afghanistan.) I'm also working on a swing for my daughter and doing some car stuff too!